There has been rumors of a Akira live action movie for a good decade or so but it looks like we may finally have a real movie in sight. Warner Bross acquired the rights to make a live action Akira movie in 2002 but that contract could expire soon if a movie isn’t in production. Lucky for everyone the powers that be have stepped up and signed Jaume Collet-Serra (Unknown, Orphan, Goal 2? WTF) to direct. As far as casting goes it’s had everyone attached from Morgan Freeman to Kristen Stewart and Keanu Reeves. Only time will tell who will play Tetsuo in this two part movie series. Manga and Anime reviews coming soon, along with news on the upcoming movie. 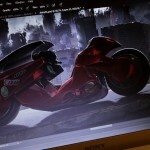 Another piece of concept art from the live action Akira movie this time featuring Kanedas bike thanks to Warner Bross concept artist called Jonas De Ro. 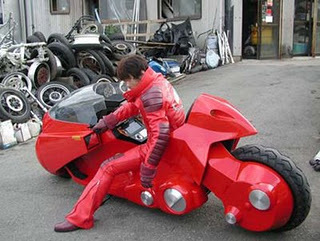 Here’s something new, its concept art from the new Akira movie. 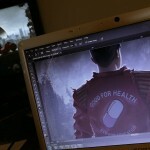 It looks like Kaneda with his signiture jacket standing in front of a nuke type explosion in Tokyo. The Japanese Manga epic Akira is still having trouble getting started. Like any comic book movie in crisis it’s the Nolans to the rescue. Enter Jonathan Nolan to pen the latest script.